A petition to stop the introduction of frozen meals for school pupils across Perth and Kinross has been signed by nearly 1500 people in less than 48 hours. The Tay Cuisine initiative was voted through at this month’s budget meeting and will see school meals prepared in Dundee before being blast-frozen and delivered to lunch halls for reheating. Fifty jobs are affected by the Tay Cuisine initiative, though the council say most of those roles will be diverted to meet the demands of increased free childcare, resulting in only nine job losses. Mr Doogan said: “It is an insult to people’s intelligence to suggest we can close down dozens of production kitchens and only lose nine jobs – we have uncovered the real figure is 50 job opportunities set to go – this is too much to take. 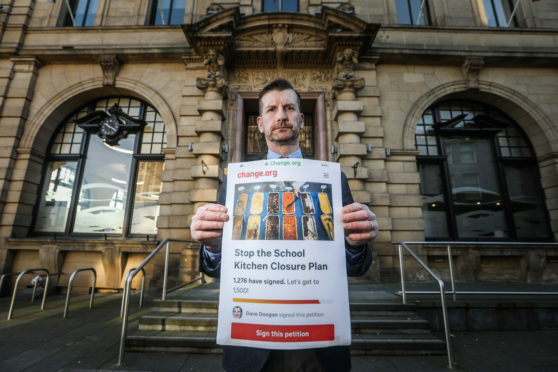 The petition was backed by SNP MSP John Swinney who said: “This job-killing proposal was forced through without the consultation of parents, pupils or kitchen staff. Caroline Shiers, the convener of lifelong learning at Perth and Kinross Council, said schools will continue to have a range of freshly prepared food as part of their meals service alongside the pre-prepared and cooked from frozen food. Ms Shiers said: “It is disappointing that the opposition on Perth and Kinross Council are not looking at the opportunities that this change will provide. “We are determined to use the move to Tay Cuisine to allow us to expand our offering and for meals to be provided to families who need them outwith the school day and also to use it as an opportunity to increase the amount of local produce used.